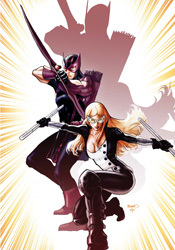 Wasn't that long ago, both Hawkeye and Mockingbird were seen as things of the past. Left behind, killed in action, mourned and buried. The same could be said for the more cheerful, happy-go-lucky style of Marvel storytelling. Left behind as passé, it was good for its time but not for the present; beloved but outdated. It's appropriate, then, that both are enjoying their rejuvenation, their return to relevance, at around the same time. Last month Marvel rolled out their optimistic new storytelling direction, and now Clint and Bobbi are back with their own ongoing series. Jim McCann's tale is a throwback in a modern setting. It's a retro-styled look back at the classic Marvel method – breathless action scenes, wisecracking heroes, firm base of operations in New York City – expertly mixed with a more enveloping threat and dialog that's a bit more legible. McCann's captured and continued the bright tone featured in Brian Michael Bendis's new Avengers #1 in this issue, which I'd suppose is kind of the point of this whole "Heroic Age" movement. These aren't grizzled, war-weathered tragic figures, they're people you'd actually want to hang out with. Interesting that the very culture the gritty anti-hero was created to rebel against is now being used to move the publisher forward into a new age. Archetypes are in vogue again. This story's excesses are also a good part of its charm. Sometimes it's tough to look past the fact that Hawkeye just jumped from a car doing 60mph down a narrow city street, landed on his feet and nailed a perfect shot with his bow. In the detail-centric culture that's sprung since the last time Marvel was this merry, we've been trained to expect elaboration on that kind of situation, whether it's a moment's stumble captured on-panel or a quick note about the pair of steel underpants the hero's wearing for just such an occasion. McCann provides neither, and frankly he doesn't need to. That off-panel discard of what might seem like vital information actually inspired me to lose myself in the story. The writer focuses on moving the plot forward, not getting caught up in the details, and that inspires his readers to suspend their disbelief and buy into the moment. The artwork, provided by Catwoman alumnus David Lopez, matches that lighter tone at every turn. Lopez works a curvy, energetic style that's ideal for a fast-paced action scene. No coincidence, then, that he gets precisely that kind of situation to make his first impressions in this issue. By the time the story moves into less explosive territory, you'll have already accepted him as a good match for this book. His influences softly transition from Steve Dillon to Tim Sale to Stuart Immonen, with a few extra stops in-between, but at the end of the day his work is fresh, sharp, exciting and wholly appropriate. I don't know if the Heroic Age will have the legs to stick around for the long haul, but for the time being it's getting the job done. Although the issue does get bogged down around the midway point, when the story's moving Marvel comics haven't been this much fun to read in some time, and it's not like their throwback style has resulted in a sacrifice in quality or modernity. This month, Jim McCann nails the difficult dynamic between the title characters, gives them each an ulterior agenda that's kept hidden from their counterpart, and doesn't forget to tie in the rest of the Avengers family. It's light enough to read in one sitting, but deep enough to bring its audience back for another installment. This isn't an issue that's going to redefine the way you think about comics, but it's inarguably a fine foundation for future issues to grow upon. Borrow it.